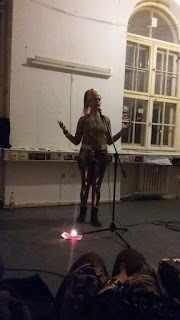 The Femme Fraktale collective from Berlin organized a very well attended event this Women's Day - 8th of March, titled "I am not your muse," at the New Yorck space in formerly squatted Bethanien Künstlerhaus. I really enjoyed performing several of my poems there and bulding an altar with my icon/painting "Our Mother of Compassion." Thanks to the beautiful audience, artists and team!